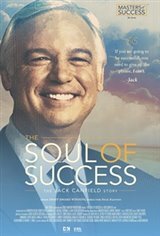 The Soul of Success: The Jack Canfield Story follows the extraordinary and transformative life and career of Jack Canfield, world renowned entrepreneur, professional speaker, and best-selling author of the Chicken Soup for the Soul series of books. Jack's journey takes him from childhood poverty in West Virginia to Harvard University, from teaching in Chicago's inner city public schools to sharing the stage with Oprah Winfrey and the President of the United States. Throughout, Jack's kindness and compassion drives him to help others live a life of success, gratitude, and joy.